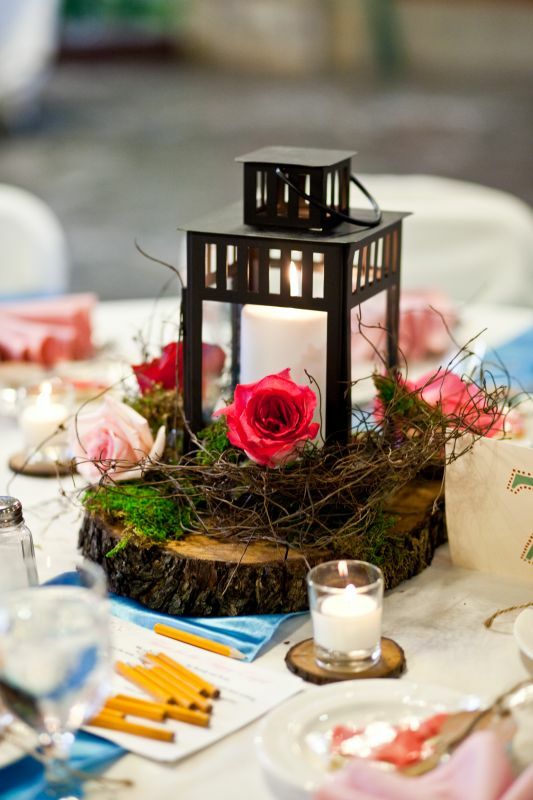 Create a beautiful ambiance for your wedding with a candle centerpiece. They are romantic, affordable, and impressive. Many of candle centerpieces are also easy enough for the DIY bride to make herself with minimal time and effort. These are some pretty candle centerpiece ideas for weddings. A simple way to make a candle centerpiece design feel more unique is to float candles in tinted water. What an easy way to create table decorations in your signature wedding colors! Can't find the right shade of blue flowers for your centerpiece? No problem - simply use food coloring to tint water the perfect shade and float some white candles in it. Add more interest by using a trio of vessels in different heights or using one very large round bowl and floating lots of candles in it. This idea can be enhanced further by filling the bottom of the clear vessels with something interesting. Add smooth river rocks for a Zen garden style, sparkling crystals to complement your crystal bridal jewelry, or marbles in a contrasting hue for a pop of color. Lanterns are a terrific way to display candles for your wedding centerpieces. The great thing about lanterns is that they come in a very wide variety, so you can find ones which will suit any style of reception. White antiqued lanterns are beautiful for garden weddings, iron lanterns are perfect for rustic receptions, and hurricane lanterns are ideal for beach or classic weddings. Plan to add some additional decorative elements around your lanterns which tie in with your wedding theme. For a beach wedding, it looks wonderful to nestle a hurricane lantern in a pile of sand. Arrange starfish and sea shells around the base of the lantern for a great effect. If you are using more elaborate lanterns for a garden wedding, twine vines and a few fresh flowers around the base. For a rustic wedding, succulents or wildflowers will make great accents. Candle centerpieces can also be beautiful for very formal weddings. 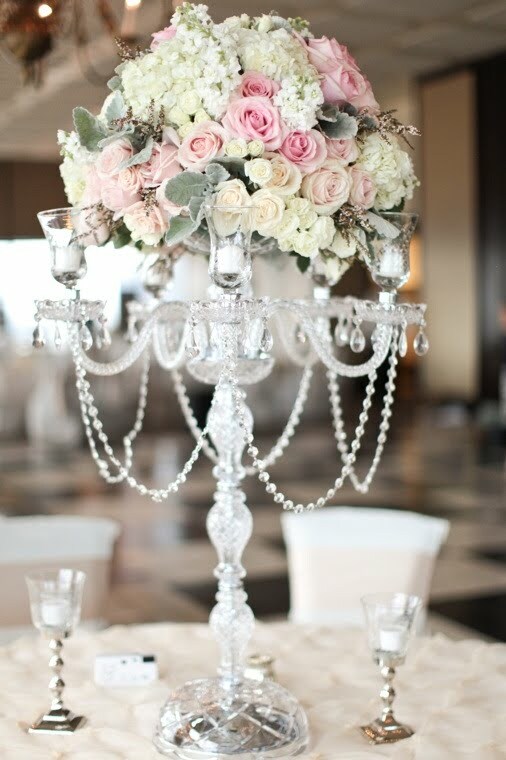 A fantastic way to add height and drama to the reception tables is to design centerpieces around tall candelabras. Formal cut crystal or silver candelabras will look very impressive when topped with elegant taper candles. Complete the design by wrapping roses and other traditional flowers around the candle bases. Dripping crystal teardrops are a gorgeous addition when the bride is wearing crystal bridal jewelry. Another idea is to weave strands of faux pearls in amongst the blossoms. These tall centerpieces are ideal for very formal or grand weddings, yet are much more affordable than creating equally large tall centerpieces entirely out of fresh cut flowers. A unique way to use candles for your centerpieces is to suspend them in large numbers over the tables, rather than resting them on the tables. This is a fantastic idea for a modern wedding, and it also works beautifully for a romantic evening wedding. Take tons of small clear glass globes and fill them will votive candles. Suspend them using clear wire at different heights over the reception tables. When guests enter your wedding reception, it will appear as if hundreds of tiny candles are floating in the air around the room. The effect of this candle centerpiece will be absolutely breathtaking, and is sure to create a wonderfully romantic ambiance for your wedding reception.